When I first saw this at Brick Lane Bikes, I thought it was a NOS Master Pista. Nope. 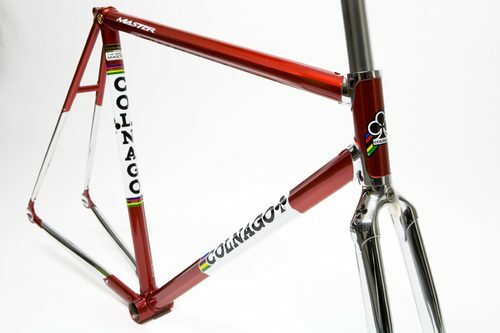 It’s a 2010 Colnago Master Pista in Saronni Red. Not bad for a re-issue. Here’s a little back-story on the significance of the color. Giuseppe Saronni won the Giro d’Italia in 1979. He then went on to win the 1982 World Championships in Goodwood, England on a red Colnago. From that point on, it was referred to as Saronni Red. Later, he went on to win another Giro d’Italia victory in 1983. After the World Championship victory, Ernesto kept the bike for his private collection. So I guess you could say you’re owning a piece of history with these bikes? Beautiful.